It is Razia Sultan’s birthday and she is none too pleased with the poem being recited in her honor. What makes Razia hopping mad is being called Sultana. She was the Sultan of the Delhi Sultanate, not the wife of a Sultan! The pesky presents on her birthday and beyond continue to anger Razia and she entrusts her band of trusted men with the task of finding the culprit. Razia Sultan is special because she is the only woman to have ever ruled the throne of Delhi!! And that too, way back from 1236-1240AD! In Razia and the Pesky Presents, Natasha Sharma uses historical facts to weave a brilliant tale of Razia Sultan and the times she ruled in. The pesky presents are fictional, but based around real events in Razia’s life. Razia was Iltutmish’s daughter, and his favored heir; because she was a woman, her brother took the throne after their father’s death. He proved to be a rotten ruler, and with the assistance of her ‘bandas’, Razia became the Sultan. She was accomplished but had to fight on many fronts to be taken seriously as a ruler. She came out of purdah and held court without it, she wore male attire, and led charge when on a military expedition. 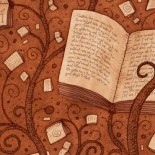 Natasha plays with words to create interesting characters. Among the many are Kaan Khan who must keep his ears open to find the sender of pesky presents, Gilas Khan the official cup bearer, and Chattri Khan who holds the royal umbrella. The book, like the others in the History Mystery series is full of humor, funny episodes and strange characters; the resolution makes one smile! 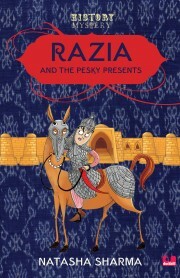 Razia and the Pesky Presents is aimed at children from 7-10, but I highly recommend it for kids younger, and adults as well! This entry was posted on May 27, 2015 by Preeti Singh in Book Reviews, Historical, Kids and tagged Duckbill, History Mystery, natasha sharma, Razia Sultan, The Pesky Presents.